The first generation of urban renewal projects stuck to the existing buildings not only in terms of parcelling and scale but often in terms of materials. This project by contrast with its rendered facades and deviating colour scheme, begs to differ from its neighbours. It constructs 81 dwelling units and retail space on five sites in all. 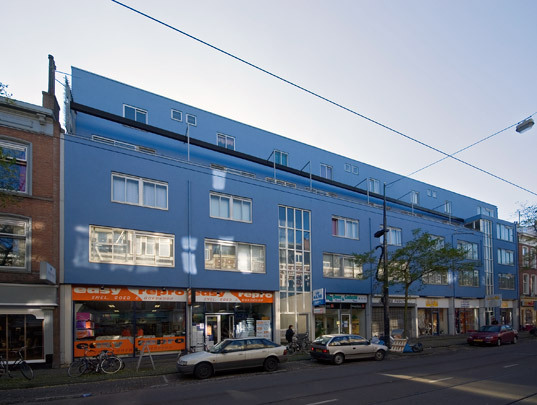 The two blocks on Nieuwe Binnenweg are the major visual elements. These have tall retail spaces on the ground floor, a first level of maisonettes with their entrances on the courtyard and a second level accessed from a gallery on the street side. A corner block sports a fully glazed bay window above the shop entrance and an ornament on the roof.